If your favorite sport is fishing and you regularly practice it, you probably already know that the prices of the surf fishing rods vary depending on the quality and size of the surf rod. However, besides the basic rule “you get what you pay for” nowadays, there are many products on the market that are overpriced. In order not to pay more for “nothing”, you need to know the basic important things about choosing the right surf fishing rods at reasonable price. Choosing the quality surf fishing rods can be really hard and confusing, especially for those who do not know anything about fishing equipment and tools. So, if you are new at this and want to buy a good and quality surf fishing rod, look for one that will work for most lure types and techniques. You need to determine some basic things. How often and where will you fish? Type of fish you want to catch and bait casting or spinning? Also, consider the following important components of surf fishing rods. Power – How firm are the surf fishing rods? This is important because heavy surf fishing rods require more power to bend, while lighter surf fishing rods bend easily. The stiffness and power of the fishing rod must match the bait size, the attached weight and the weight of the fish. For example, for large fish you will need a strong and stiff rod, while for smaller fish you will need a lighter rod. 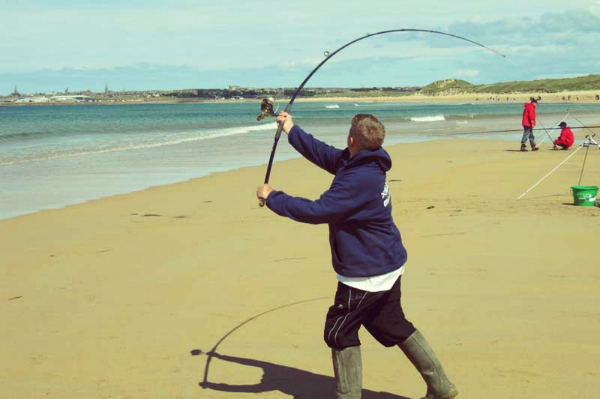 Action – This component refers to the flexibility of the surf fishing rods. There are slow, medium and fast action rods and in order to know the type of action rod you need, hold the rod and give it a fast jerk with a snapping of your wrist. With the fast action fishing rod, only the tip will move. With medium action rod, the tip and little below the tip will move, while with slow action rod, the entire rod will quiver. A slow action rod is better for casting lighter baits, while a fast action surf fishing rods are more sensitive. Material – High quality surf fishing rods are made of reinforced materials, while average rods are made of the same material just without some cross-winding reinforced materials. However, you need to pay attention on the insert material too. This is very important since the insert holds the guides of the rod. Choose a surf fishing rod with silicon or titanium inserts and try to avoid surf fishing rods that use inferior materials like plastics. Length – Long surf fishing rods are usually designed for surf and pier fishing, while short fishing rods are preferred on a boat because they are easier to manage in smaller spaces. All these components are essential if you want to choose the right surf fishing rods and become a good angler. To ensure you make the right choice, consult with professionals who will guide you and show you what type of fishing rod is best for your needs.